Initial Reaction of Book in One Word: Eh? 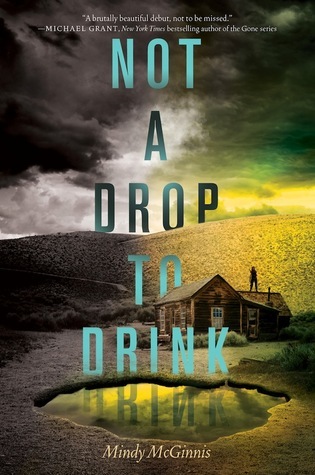 When I first heard about Not a Drop to Drink, I liked the cover, thought the synopsis was interesting, and was intrigued since Michael Grant (author the Gone series) blurbed it. So when I saw it on Edelweiss I requested it and got accepted. I began the book and liked it, but then stopped a little over halfway through (not because I wasn't liking it, but because I read something else instead and some other things came up). Unfortunately, I think that three month break may have had an effect on my opinion of the book, but I will still try to get my thoughts across. Not a Drop to Drink is different from a lot of YA out there, at least from what I've read; I can't think of anything quite like it, though I can think of some books with that sort of realistic grit to it. There's something about the voice and the storyline that's just...organic? I don't even know what word I'm looking for, to be honest. It's just, like I said, different. But while the book had a unique something to it, it was also missing something. Throughout the book, you're sort of waiting for something to happen. One paragraph you're in today, the next it's weeks later. Now that's fine, and it worked in most instances, plus the book was a quick read and flowed relatively well, which was nice. But while Lynn, the MC, and her mother keep an eye out for trouble (or people coming for their pond/water supply) on the roof with a gun in their hands, you're waiting for that trouble to show up. Because when's it not there, you're going through the daily (and hard) routine that Lynn and her mother go through, with the occasional variation. No, it wasn't all that. In fact, there was a lot of story told during those routines, from how Lynn lived to why people are thirsting to survive. It could just get a little slow and slightly boring, but it wasn't a huge issue. Time (one day in this paragraph, weeks later the next) became an issue with the romance. With those days lost, I didn't get to see the romance build up a whole lot, and that made parts of it seem kind of instant. As in, they're saying that and doing this but I've only read them together for a few pages total? Don't get me wrong--I liked the romance (I like romance in my books). And I understand that with Lynn, it's been her, her mother, the occasional appearances of their neighbor Stebbs, and people coming through for water (unsuccessfully) all her life--so when this cute boy shows up, she starts to feel something, and she's never had that before. In that way, it makes sense, a bit. But still...a little too quick for me. There was an interesting cast of characters, some of which I liked more than others. If someone didn't make many appearances, I didn't care for them too much or make much of a connection. It's told from the POV of Lynn, a teenager who lives in a house on a pond with her mother. They spend every day watching for intruders and danger with guns and going through a process to make water safe to drink. Everything they do is for survival, and they live on necessity--the house is too big to heat, so they stay in basement, for example. I didn't mind Lynn, but I wasn't a fan of her mother, who's more of a hardass than her daughter. (Though they both can lack a sense of humor, and since Lynn has no exposure to the outside world and doesn't know the world pre-water issues, it explains parts of their behaviors.) I loved Stebbs, the neighbor. He's an older man with a bad foot he drags around, but something about him was just...nice. A refreshment from the girls' personalities. There was also Lucy, who I didn't mind much. Lucy causes Lynn's character to evolve into someone that could care for a little girl. I also didn't mind Eli, and wish we could've gotten more from him. Did I like it? Yes...For the most part. Would I reread it? Ehhh. Would I purchase it? I love the cover, but unless it's for a great deal, probably not. Would I recommend it? I wouldn't say "no, don't read this," but I wouldn't shove it in your face, either. However, I have seen some reviews of people who quite liked this. I actually liked the ending especially because it was a standalone-it gave me some hope without being too optimistic. But overall this book just didn't cohere for me and I didn't love any of the characters. I just finished this and I'm writing my review, and I have to say I agree with you. I'm actually annoyed by lots of things in this book, and I can't figure out why it's getting so many four and five star reviews on Goodreads.